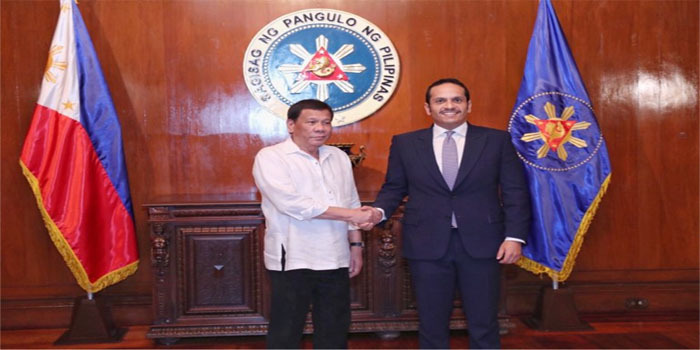 The President of the Republic of the Philippines, Rodrigo Duterte, met yesterday with Deputy Prime Minister and Minister of Foreign Affairs H E Sheikh Mohamed bin Abdulrahman Al Thani, during the visit he is paying to the Philippines. At the outset of the meeting, the Minister of Foreign Affairs conveyed the greetings of Amir H H Sheikh Tamim bin Hamad Al Thani to the President, as well as conveying the hopes of H H the Amir for further progress and prosperity to the people of the Philippines. For his part, the President sent his greetings to H H the Amir, and wished him health and happiness and for the people of Qatar further progress and prosperity. The meeting focused on discussing bilateral relations and the means to enhance them, in addition to discussing a number of issues of joint interest. The Minister of Foreign Affairs stressed on the strength of ties, and on the State of Qatar’s commitment to enhancing them along with increasing economic and political cooperation with the Philippines.